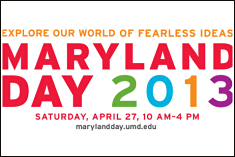 Please join us for the 15th annual Maryland Day, on Saturday, April 27. With over 400 events, demonstrations and activities -- all free -- there is something for everyone. Come "Explore our World of Fearless Ideas!" Copyright © 2019 University of Maryland.